Join art historian Dr Christopher Allen on a journey to the alluring Mediterranean islands of Sicily and Malta, with their wealth of art and archaeology from the Neolithic to the Baroque. 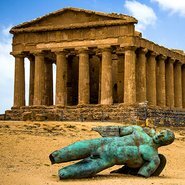 Explore Sicily’s classical Greek and Roman theatres in Taormina and Syracuse, the Valley of the Temples in Agrigento and the Norman churches of Palermo and Monreale. Discover the riches of the tiny island of Malta, whose Neolithic temples still stand as some of the oldest religious structures on earth. Three full working days (Mon–Fri) notice is required to qualify for a refund. All refunds attract an administration charge of 25% of the ticket price(s) with a minimum charge of $5.